I’ve found a new love for post office boxes. Not the boring rows of metal doors at the more contemporary post office locations in town, but rather the old, glamorous, gilded metal boxes that take up hallways of space in our downtown post office. This building has been around since who knows when – I’d like to think it has history – I suppose it could have been built 20 years ago, but my goodness I just think I’m falling in love with that post office. What potential those boxes have – little doors full of secrets, and love letters, and handwritten notes that get flown across the country with a stamp. Maybe some magazines you look forward to every week, or perhaps too, these boxes contain boring things like bills and reminders to vote. It doesn’t really matter what is actually in the box, but to me, they are starting to represent the ordinary in a beautiful package. We wait for this correspondence, and open the door, and peek with our big eyes and cram our little hands into mail boxes hoping for some connection with the world – that someone, somewhere, was intentionally trying to get a hold of me. Call me nostalgic, but I love snail mail, and I love connection with others – something that I feel is drastically missing for me right now. I guess I’m growing, my friends are moving, I’m getting married, and my tethers to things once so comfortable and familiar are changing. I’m being encouraged to make new connections, seek new sources, and tap into my own little golden box of secrets and waiting and promise of new, good things to come. Why, you may ask, am I spending so much time at the post office? 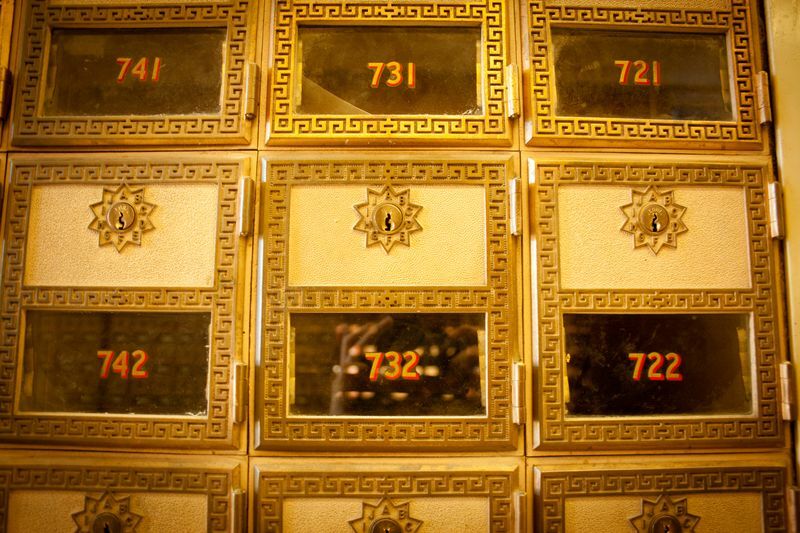 Well part of my job is to check our PO box for work – a small task that takes 2 to 3 minutes a week. But what is beautiful about this new ritual, is I get to conveniently take the walk 3 blocks down to the main building which takes me through the center of downtown and I get to interact with my community in a different way. Walk! You see so much more of this world. So this week, my beautiful things involve the post office. I set out today at about 3 pm. 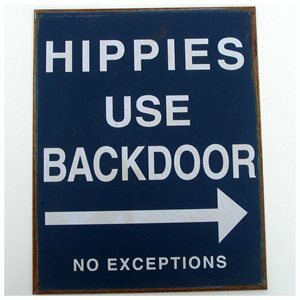 Block number one – I pass a thrift shop which quite often displays its wares on the sidewalk – today a red velvet couch, a stroller from the 1980’s with a bright colorful pattern, and a sign that says “Hippies Use the Back Door” were going for a bargain. I have an odd fascination with other people’s stuff – someone, once upon a time loved that sign. What changed in their lives that made them want to give it up? Block number two – I pass by the Catholic Elementary School just as school is being released. The bus is waiting, parents patiently make eye contact with their eager little ones, and five and six year olds in plaid skirts and polos rushed out of the doors while the church bells rang. I was not raised Catholic, but I do have a great respect for their traditions, and those chiming bells were beautiful noises as they mixed with the laughter of little ones almost ready to embrace summer in full. The beautiful brick building and stain glass windows gleamed in the afternoon heat. Block number three – I passed the walking post woman on the way to the office – her basket on wheels full of other people’s lives. She smiled, I nodded, and we agreed that 84 degrees is a little bit warm for the end of May. A small interaction, so much potential. As I walked through the doors of the main building to seek out our own PO box I was taken aback by the new security guard at the front entrance. He was checking ids, and names on packages, and seeing who you are before you get in line at a federal facility. A quick, abrupt reality check that the world we live in can be scary and dangerous and disheartening. We saw the movie, “Noah” this weekend, which I highly recommend. I could go on and on about the movie – but that would take this post in a whole different direction. Instead, I really liked the message that the movie sends. The character Noah says, and I’m paraphrasing here, that we are given the choice to “focus our energies on the temptation of darkness” or we can pay attention to the hope and “the blessing of light”. Each day the world’s negativity, the threats, the inequality, the terror tempts me to dwell in darkness. Instead I want to choose the blessing of light – celebrate the ordinary, say thank you for routine, my afternoon walk, and the mystery of human connection. I set my eyes on the little golden boxes, got our mail, and headed back to work. Please, please, please when you go to the post office tomorrow, would you buy that sign for me? I’ll pay you back, I pinky promise. I love this because it not only makes me feel nostalgic and sentimental, but because it reminds me how beautiful it is to breathe in and feel the simple, truthful parts of our ordinary lives to find their wonder and charm. Whitney I’m so glad! That’s exactly what I’m going for!